A simple yet effective warning to service shops to not flash the ECU. 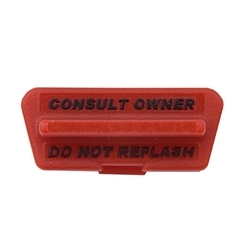 Easily protects your expensive custom firmware from being erased or modified by being clipped onto the OBDII port of any vehicle. Engraved in the cover is the message: DO NOT REFLASH, CONSULT OWNER. Available only in red, the new version is a smaller one piece design that is extremely durable and will not come off unintentionally.